So many things have changed in the digital age that it is sometimes hard to judge which parts of your marketing plan should change, and which should remain constant. Life science market research is an area in which we recommend you revise your strategy, and we explain the top five reasons below. Increasing segmentation. Life scientists are becoming more segmented online, being able to choose from myriad journal feeds and news sources that fit their research field. Methods for reaching your customers must be equally segmented, and you need to understand their needs and habits. The results and even the process of doing more market research will benefit you. For example, if you promote your survey on Twitter and don’t get a good response, you know that this application is not a good way to reach your customers. Improving the amount and relevancy of your life science market research will ensure that you know the best way to reach and engage your customers. Need for customer engagement. Your customers are now choosing which life science companies, if any, to follow and interact with online. These decisions require engagement, whether it be liking a Facebook page, commenting on a post, or uploading a photo. Therefore, you must know how to motivate them to engage with you and what they’re willing to do. For example, if your customers are microscopists, they may be more interested in uploading photos than if they’re studying, for example, epigenetics. Asking them about their likes and habits is the best way to find out! Get timely, actionable results. 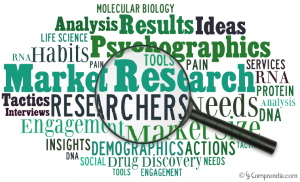 Published market research reports still have their place for life science marketing plans. Depending on the size of your company, you likely have access to 1-3 for business plans and forecasts. However, by the time they are published and purchased, they might be outdated for today’s fast moving landscape. Also, they don’t often answer the specific questions you have regarding your strategy and tactics. What do your customers think of your brand or product line? What is their “pain” at a broad level? Would they sign up for a forum if you created one? By starting with the questions you need answered, and making sure each question’s response will lead to unequivocal answers, you’ll receive timely, actionable results from your survey. It’s now easier. We’ve talked about the need for life science companies to create and expand their own distribution channels. Whether you have 20,000 Twitter followers, or just a newsletter subscription list, you now have easier ways to promote your surveys. Applications such as SurveyMonkey now make it easy to design and implement your survey. Do your homework, however, and make sure that the survey is designed to get results—keep it short and offer attractive rewards to respondents. If your results aren’t as expected, or you think your customers wouldn’t fill out an online survey, consider phone interviews. Both methods can be conducted “blind” if needed, so that respondents aren’t aware which company is conducting the survey. Make important connections. We perform life science market research often for our clients, and we often find customers who are very interested the subject of the survey. These enthusiasts are great resources to get ideas from and to participate in your campaign once it has launched. If they are excited about your project, they may also be thought leaders in your field and may promote your efforts as well. Life science market research, while not a cake walk, is no longer limited to waiting for published reports. Including more customer feedback in your marketing plans is essential to compete in today’s fast-moving life science marketing landscape.